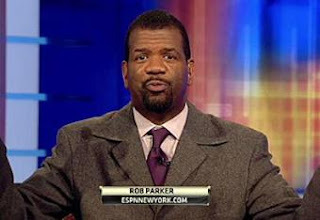 Rob Parker fired, If Rob Parker is the reason you tune in to ESPN's "First Take" every morning, then you're probably about to stop watching one of the only sports debate shows on television. After the network decided it was not prudent to renew Parker's contract in the coming days, ESPN and the much-beleaguered analyst are parting ways in the wake of comments about the racial status of Washington Redskins QB Robert Griffin III.....bleacherreport. The move was the only option given the circumstances and hopefully it will start to spread more fear in the minds of commentators that want to step over the line. ESPN Public Relations worker Mike Soltys broke the news on Tuesday afternoon that ESPN would not renew Parker's contract.Notice that Soltys didn't shy away from mentioning Parker's RG3 comments as one of the main reasons for why he won't be returning to ESPN. That should be reason enough to feel the weight of the outside world on ESPN to do the right thing after Parker used his "First Take" platform to publicly question whether or not RG3 was "down with the cause". If you haven't heard Parker's comments, they were a response to RG3 saying he didn't want to be seen as an African American QB or football player, just the best at what he does.ESPN suspended Parker for 30 days following his comments about RG3 on Dec. 20, but apparently realized that its credibility would be further damaged by allowing Parker to return to the set for another discussion of how black athletes should conduct themselves as to not damage their cultural reputation. If you read this interview Parker conducted with Awful Announcing on Sunday, it isn't hard to understand why ESPN chose to let the former Detroit sports personality walk away. Instead of owning up to his actions, Parker claims he wasn't attacking RG3's blackness and that people just took his words out of context. Asked point blank if he regretted his comments, Parker never reciprocated that he wished he hadn't broached the discussion about how Griffin is perceived in the African American community.t's clear that Parker has no remorse for his actions, and I have a feeling this final interview helped seal the deal for producers of the show and people at ESPN that didn't want the company name being dragged through the mud anymore. After looking at all the evidence, ESPN did the right thing here. In an age of cultural acceptance and equality being pushed at every turn, Parker takes culture back to the middle of the 20th century with phrases like "our people", "cornball brother" and "down with the cause".Griffin has conducted himself with class and respect during his tenure in the NFL and his recent injury shows us just that. There was no place for a debate on this subject, whether or not it was discussed in the ESPN producer's meetings. ESPN has enough problems with commentators. Heck, look at Brent Musburger's comments during the National Championship Game on Monday about Alabama QB A.J. McCarron's girlfriend—there's clearly a lot of public relations nightmares to deal with without having to revisit this subject. The network made the right decision here. It's back to more Stephen A. Smith and Skip Bayless debates—until ESPN discovers another Rob Parker.